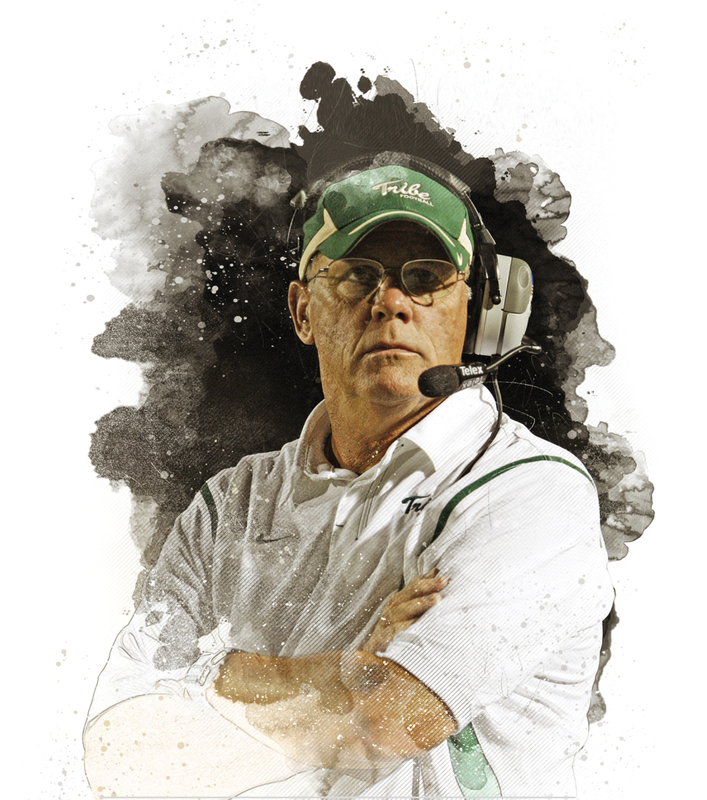 Six years into his tenure as William & Mary’s head football coach — and six wins into a historic 1986 season — Jimmye Laycock ’70 led the Tribe against the University of Virginia. After a five-touchdown performance by W&M quarterback Ken Lambiotte ’87, M.S. ’92, George Welsh’s Cavaliers fought and then folded. But the victory celebration would be short-lived. During the postgame celebrations, 29-year-old Tribe assistant equipment manager Pat Gantt hit the ground and, in that instant, became paralyzed from the waist down. Gantt remained a fixture on the Tribe sidelines for many years after that, but when the Tribe returned to Charlottesville in 2009, Laycock had one thing on his mind: win this one for Pat. After B.W. Webb ’12, who now takes the field for the New York Giants, carried his third interception of the day into the end zone, the outcome was certain. The neckties and sundresses filed out of Scott Stadium and the thunder of William & Mary’s chorus began to play. Coach Laycock handed the game ball to Pat Gantt, 24 years later. Before passing away in 2013, Gantt lived to see his name emblazoned on the Tribe coaches’ locker room. Laycock’s championing of Gantt — and uncounted scores of others — represents intertwined aspects of what it means to be a legendary football coach, and Laycock hopes that will be his legacy after 39 seasons. Not just his 249 wins, but his ability and responsibility to change lives for the better. But his 249 wins don’t hurt. “I have three emails I printed out,” Laycock says. “One from Marv Levy, one from Lou Holtz, and one from my high school coach.” Since announcing his retirement in August, Laycock has received handwritten letters from an array of former players, fellow coaches and faculty members. For the uninitiated, both former William & Mary head coaches happen to be Hall of Fame members, Levy in the Pro Football Hall of Fame and Holtz in the College Football Hall of Fame. The trick has always been to take things one game at a time: this week is Villanova, next week is Richmond; let’s not get ahead of ourselves. But now there isn’t a next game to coach. After the 27-20 Homecoming thriller against Maine, retirement started looming larger and larger. But it’s not like his legacy wasn’t already all around him. His office commands a spectacular view of Zable Stadium at Cary Field, renamed and expanded under his watch, from the adjacent football center that bears his name. For the season and career finale against archrival Richmond, hundreds of former players made the trip back to Williamsburg to pay tribute to Coach. But they were far from the only ones. At James Madison on Sept. 22, Laycock was presented with a framed sideline photo of the Nov. 13, 2004, game — which the Dukes lost. On the 50-yard-line of Virginia Tech’s Lane Stadium, he got a piece of Hokie stone from his old friend and former colleague Frank Beamer, who shared Laycock’s experience of coaching an alma mater for years. To a fan, though, it might seem like the universe is finally getting some good-natured payback: upending expectations for a man who has made a career of doing the exact same thing. After four years of playing for the Tribe, Laycock did what a lot of young coaches do: move from job to job and learn as much as possible. He coached the offensive backfield at The Citadel alongside Beamer, reporting to future Chargers and Lions coach Bobby Ross. After spending two seasons looking after quarterbacks at Memphis State, he became the offensive coordinator at Clemson University in 1977. This put him in charge of Dwight Clark, who went on to make The Catch for the San Francisco 49ers, thanks to a ball thrown by some guy named Joe Montana. If it’s starting to seem like Laycock is the Kevin Bacon of college and professional football, you don’t yet know the half of it. In 1980, he got the call that so many coaches dream of: come back to campus. Laycock couldn’t say no to the chance to coach his alma mater. But he also got a second call, from future Auburn head coach Pat Dye. William & Mary was small-time, people said. A steppingstone. In 1978, the NCAA cleaved Division I into two, leaving the Tribe in the smaller half known as I-AA. Budgets were getting smaller. There were rumors that William & Mary might cut football altogether. Laycock today isn’t sure he understood how serious those rumors truly were, but who could blame him? He was the youngest head coach in all Division I at just 31 years old. Sorry, your browser does not support embedded video. 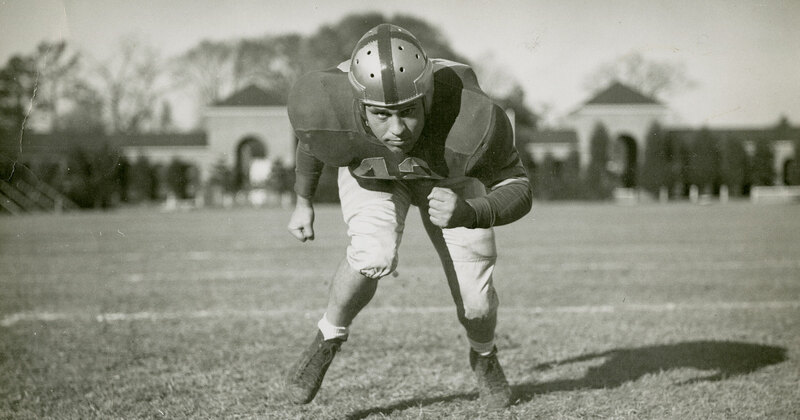 It soon became clear William & Mary had hired a coach with a wide-ranging offensive mind, a knack for big plays and a real talent for developing quarterbacks. Among early stand-out players, Mark Kelso ’85 was an intimidating defensive back who went on to play seven seasons with Marv Levy’s Buffalo Bills. That meant doing what many in football considered close to impossible: matching high standards in the classroom to high performance on the field. Gannon, the 2002 NFL MVP. And throughout the season, William & Mary had an unexpected boost by a Canadian soccer-player-turned-kicker named Steve Christie ’90. Christie, like several former players, appreciates Laycock’s approach more now than he may have during his playing days. And Laycock had plenty of reason to appreciate Christie: his Canadian kicker held the Tribe field goal record for 20 years. 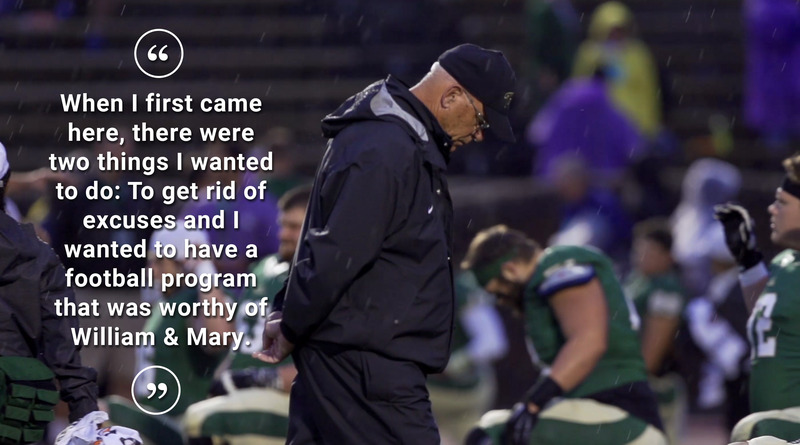 Coach met William & Mary’s high standards with unusual recruiting methodology — like a robust walk-on program — and it was paying off. The 1986 campaign was good enough to put Laycock on the short list at Duke University. But the job went to someone else, and Laycock spent the late ’80s fending off rumors that he’d be off to coach at a bigger school. None of it kept the program from traveling. In 1988, the Tribe ventured to the first-ever Epson Ivy Bowl in Japan, where they beat a team of Japanese all-star players. The Tribe made the playoffs again in 1989 and 1990. After 11 seasons in the top job, Laycock had already become the longest-tenured coach in William & Mary history. With continued success, the offers started to get even more serious. Later, famously, he accepted the head coaching job at Boston College on Nov. 19, 1990 — and then turned it down the very next morning. Firmly planted in underfunded and decaying athletic facilities, Laycock guided his 1992 and 1993 teams to nine-win seasons, including a return trip to the Epson Ivy Bowl in January 1993. It was a killer start to a tercentenary year. Laycock coached a future protege in Mike Tomlin ’95, L.H.D. ’08, who went on to win a Super Bowl coaching the Pittsburgh Steelers. But in Williamsburg, Tomlin was a prolific wide receiver. Every few years, Laycock would put together a team of smart, athletic but underappreciated recruits from Virginia, New Jersey, Pennsylvania and elsewhere, make them into a potent winning machine, and send them off to productive careers in football and other professions. A number of his former assistant coaches have moved on to more prestigious posts around the game of football, not least of all Dan Quinn, the 1994 defensive line coach who took the Atlanta Falcons to Super Bowl LI. Some thought the 1996 William & Mary team could have won a national title had it not been for a second-round playoff fumble. For a coach known for quarterbacking, the ’90s defenses were just as formidable, producing one conference defensive player of the year and multiple all-conference standouts and All-Americans. Hybrid tight end and punter Mike Leach ’00 went on to 15 years as a long snapper in the NFL. One former free safety, Sean McDermott ’98, is the current head coach of — you guessed it — the Buffalo Bills. To top it off, by 1999, William & Mary had defeated Richmond in 10 consecutive games. In 2001, he led the team to an Atlantic 10 conference championship behind the offensive fireworks performed by quarterback Dave Corley ’03, current Penn State wide receivers coach, and receiver Rich Musinski ’04. By the summer of 2004, though, both of them had graduated. Fans wondered where the points would come from — but Laycock didn’t. Campbell was a lot like Laycock: they were both from the same region of northwestern Virginia and had both been football and basketball stars in high school. Campbell would “naively” greet the famously terse Laycock in the hallways with a “hey Coach!” until he wore him down. As a walk-on, Campbell represented another way that Coach would try to get the leg up on his competition. Campbell took the quarterback job in 2003 and exploded in 2004. Thirty touchdowns and nearly 4,000 yards later he had become the best player in all of I-AA, receiving the Walter Payton Award. He credits Jimmye Laycock’s sideline experience and his ability to coach up a walk-on for the win. Following a heart-stopping double-overtime playoff game against Delaware, the 2004 Tribe was soon preparing for a gigantic rematch with JMU. ESPN2 came to town with temporary lights in tow. 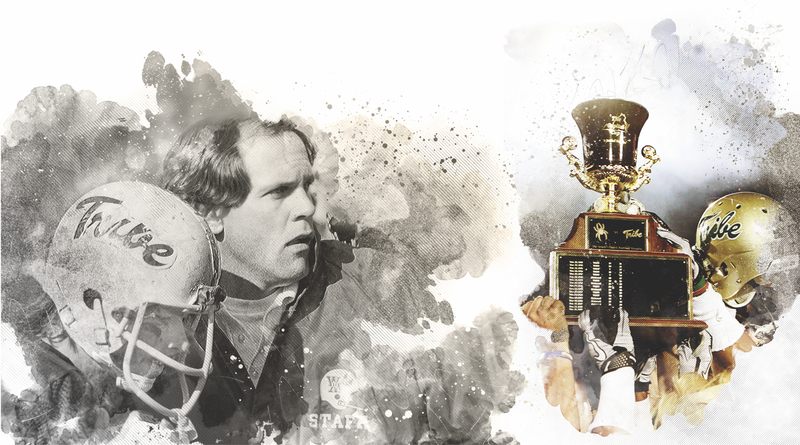 It was a singular moment in William & Mary history and helped set an entirely new era of Tribe football in motion. The temporary lights inspired donors to install permanent lights, which was the first step toward improving the long-suffering facilities. In 2008, a brand-new facility opened next to Zable, with state-of-the-art locker rooms, offices and meeting spaces: the Jimmye Laycock Football Center. Tomlin, Beamer and Levy were among those on-hand for the dedication. Two CAA championships followed in 2010 and 2015 alongside a series of mostly defensive players ascending to the NFL after graduation — subverting the usual assumption that Laycock was mostly an offensive-minded coach. 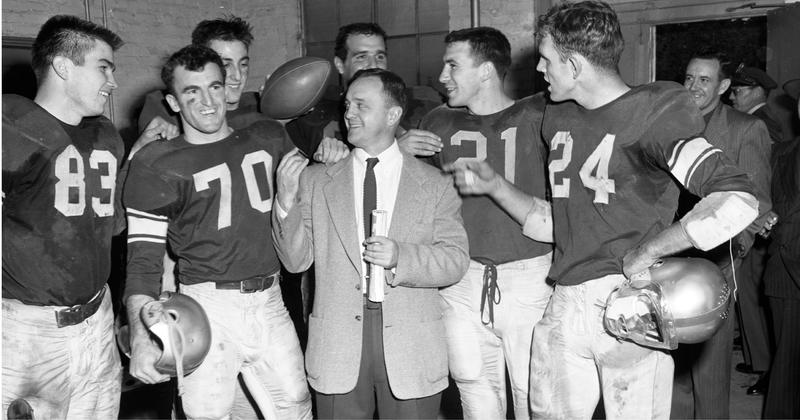 He shepherded no fewer than 20 of his players into NFL drafts or training camps, cementing his record of converting young, wide-eyed “knuckleheads” into promising men and football players. On that mark, he’s been consistent. Local sportswriters who have been covering W&M football for years can’t help but comment on how consistent Laycock has remained. “Jimmye’s legacy is one of sustained excellence and integrity, and for a college coach, it gets no better,” says David Teel of the Daily Press. “I don’t want to shortchange anybody or the school,” Laycock says. His retirement announcement in August gave new William & Mary athletic director Samantha Huge plenty of time to conduct a thorough search for his recently announced successor, Mike London, Laycock’s former defensive line coach at William & Mary from 1990-93. Newly 70, Laycock is in great health, perhaps a byproduct of his obsession with process on the football field. His players summarize his years of teaching in a few succinct ways, as befits the man of such few words. When Laycock lets himself think about life beyond the season finale, he realizes that his Saturdays are about to become wide open. He has two grandchildren and four children (Michael, Mimi ’14, James and Melanie) scattered in four different states. With his wife Deidre, he’s about to trade zone reads and run gaps for sandcastles and par-threes. Special thanks to William & Mary Athletics and Pete Kalison ’57 for their help with this article.